Anderson Creek Hunting Preserve, Lillington, North Carolina, offers several types of birds for hunting. “The name “bobwhite” derives from its characteristic whistling call. Despite its secretive nature, the northern bobwhite is one of the most familiar quails in eastern North America because it is frequently the only quail in its range. There are 22 subspecies of northern bobwhite, and many of the birds are hunted extensively as game birds. Size: 10 inches long with 15-inch wingspan, round body. Colors: Brown, buff, rufous, white, black, gray. “The Mallard lives in wetlands, eats water plants, and is gregarious. The Mallard is the ancestor of most domestic ducks, and can interbreed with other species of genus anas. 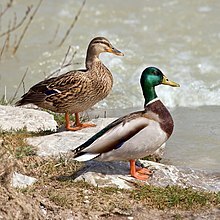 A noisy species, the male has a nasal call, and a high-pitched whistle, while the female has a deeper quack stereotypically associated with ducks. “Ring-necked Pheasant is both the name used for the species as a whole in North America and also the collective name for a number of subspecies and their intergrades which have white neck rings. “The Wood Duck is a medium-sized perching duck. A typical adult is from 47 to 54 cm (19 to 21 in) in length with a wingspan of between 66 to 73 cm (26 to 29 in). This is about three-quarters of the length of an adult Mallard. It shares its genes with the Asian Mandarin Duck (Aix galericulata). The adult male has distinctive multicoloured iridescent plumage and red eyes,with a distinctive white flare down the neck. The female, less colourful, has a white eye-ring and a whitish throat. Both adults have crested heads. When swimming, Wood Ducks bob their head back and forth in a jerking motion, which makes them easy to spot. “The white-tailed deer (Odocoileus virginianus), also known as the Virginia deer or simply as the whitetail, is a medium-sized deer native to the United States (all but five of the states), Canada, Mexico, Central America, and South America as far south as Peru. The deer’s coat is a reddish-brown in the spring and summer and turns to a grey-brown throughout the fall and winter. The deer can be recognized by the characteristic white underside to its tail, which it shows as a signal of alarm by raising the tail during escape. 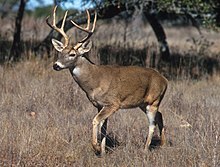 The white-tailed deer is highly variable in size, generally following Bergmann’s rule that the average size is larger further away from the Equator. North American male deer (also known as a buck or stag) usually weighs 60 to 130 kg (130 to 290 lb) but, in rare cases, bucks in excess of 159 kg (350 lb) have been recorded. In 1926, Carl J. Lenander, Jr. took a white-tailed buck near Tofte, MN, that weighed 183 kg (400 lb) after it was field-dressed (internal organs removed) and was estimated at 232 kg (510 lb) when alive. The female (doe) in North America usually weighs from 40 to 90 kg (88 to 200 lb). White-tailed deer from the tropics and the Florida Keys are markedly smaller-bodied than temperate populations, averaging 35 to 50 kg (77 to 110 lb), with an occasional adult female as small as 25.5 kg (56 lb). White-tailed deer from the Andes are larger than other tropical deer of this species and have thick, slightly woolly-looking fur. Length ranges from 95 to 220 cm (37 to 87 in), including a tail of 10 to 36.5 cm (3.9 to 14.4 in), and the shoulder height is 53 to 120 cm (21 to 47 in). Including all races, the average summer weight of adult males is 68 kg (150 lb) and is 45.3 kg (100 lb) in adult females.